Even the CEO's positive blog post can't change the numbers. Intel CEO Brian Krzanich condemned hate speech and white supremacy on Twitter after the horrifying events in Charlottesville this weekend. On Monday, he resigned from Trump's American Manufacturing Council to "call attention to the serious harm our divided political climate is causing to critical issues..." Now, alongside a mid-year diversity report that documents some slow and flat growth in diversity at Intel, Krzanich is touting his company's "fast march" toward the full representation of women and unrepresented minorities in Intel's US-based workforce by 2018. That's only one year away. In the blog post, Krzanich says that Intel is two years ahead of the original plan, which aimed to create a diverse, inclusive workforce. "We set out to achieve by 2020 an inclusive workforce that reflects the diversity we see every day in the world around us," he writes. "Doing this would bring the number of female, Hispanic, African-American and Native American employees in Intel's 50,000-strong U.S. workforce to full representation." The new goal, he says, is now moved up to 2018. The mid-year report states that the five-year plan is on track to equally represent women, African Americans, Hispanics and Native Americans in both technical and non-technical jobs. "In December of 2014, our gap to full representation was 2,300 employees. Today that gap has narrowed to 801 people – a 65 percent improvement." 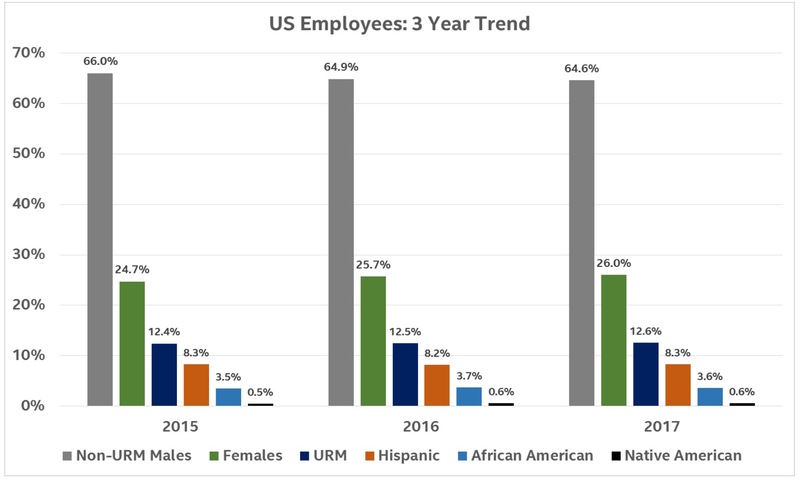 While it's nice to see a move toward a more diverse Intel workforce, it's hard to not feel discouraged with such a slow rate of growth over the past three years. White men are at the top of every chart in Intel's 2017 diversity report. With only a 0.3 percent growth in female employees across all sectors of the company (and a flat rate of growth for African Americans, Hispanics and Native Americans), how can Krzanich say his company will be on track in just one more year? By defining "full representation" as a function of "market availability." Intel defines full representation as the full market availability of women and underrepresented minorities, which means that it bypasses any actual efforts to create more space for diverse people in the workforce in the first place. The company has updated the way it measures market availability, which tracks how many skilled workers exist in both the US labor market as well as within Intel's own employee base, but it hasn't been updated since 2014. As with the rest of the tech industry, Intel says that white and Asian males continue to represent more than 90 percent of mid- to senior-level technical roles. Intel is also having a hard time retaining minorities, too, though it has added "diversity playbooks" and other programs to help (predominantly white) managers hire and retain workers. Intel claims it's on track to train all of its more than 13,000 managers by the end of the first quarter in 2018, but is that enough? If nothing else, the company should be looking to programs to increase the market availability of the women and other underrepresented minorities in the first place.